One of the great things about taking a vacation all by yourself is that you get to do pretty much whatever you want. And one of the things I wanted to do when I was traveling in Vermont at the end of the summer was learn about cheese. Vermont is known for its cheddar cheese, so I stopped into the Grafton Village Cheese Company in Brattleboro for a tour. Grafton's marketing guru Alise Sjostrom met me in the large retail store just inside the front door of the barn-like building pictured above. She told me a little of the company's history. 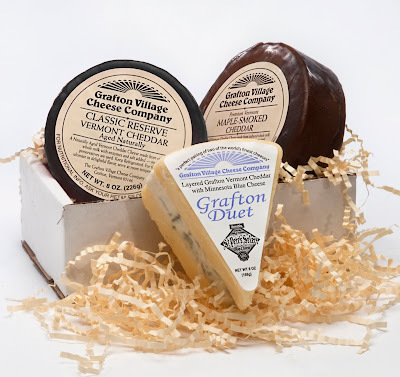 The Grafton Cooperative Cheese Company was founded in 1892 in Grafton, a village in southern Vermont, by a group of dairy farmers who needed a way to preserve their excess milk. The original factory burned down in 1912, but in the 1960's, the Windham Foundation, a nonprofit dedicated to preserving Vermont's rural nature, rebuilt the factory, as well as much of the town of Grafton. The company now makes cheese both in Grafton and in the newer facility in Brattleboro I visited. The cheese company is actually owned by the Windham Foundation, so all the profits from sales of Grafton's cheddar go straight back into rural Vermont. We looked through huge glass windows at two strapping men "cheddaring" - that is, raking the curds to separate them from the whey so they can be pressed into blocks and aged. They use their rakes to press the curds against the sides of the tank, and the whey flows out through drainage holes. Next we went to the cutting room. All Grafton's cheddar is cut, weighed and packaged by hand. Some of the aged cheddar Grafton produces is smoked. Their smoker is about the size of a big refrigerator and sits off in a corner by itself. As you can see from the signs, it gets very HOT. In the aging warehouse, cheese is packed in plastic and then in cardboard boxes. The boxes are carefully labeled with dates and lot numbers so they know exactly when it was made and how long it's been on the shelves. Let me tell you - there was A LOT of cheese in there. One of the things I learned walking through the warehouse is that Grafton private-labels its cheddar for gourmet stores like Zingerman's, Dean and Deluca, and Gourmet Garage. When you see a hunk of store-brand Vermont aged cheddar at any of these places, there's a good possibility it came from the Grafton factory. Back in the shop, I sampled cheddar that had been aged one, two and three years. My favorite was the two-year - it was creamy with a tiny bit of graininess, and the flavor was superb. The three-year cheddar was a little dry for my tastes, and the one-year was delicious but very mild. I also tasted smoked cheddar and a cheddar with paprika and caraway seeds, both interesting. As I left, Alise gave me a little cooler bag with samples of four Grafton cheeses. I took them with me to the friends I was visiting in the Berkshires. We liked them all, but my favorite was the horseradish cheddar. I'm a sucker for horseradish. If you're planning a trip in New England, I'd highly recommend finding a few cheese factories to visit. Most of them give tours and are delighted to explain the cheesemaking process. And they almost always have a tasting room...the best part! 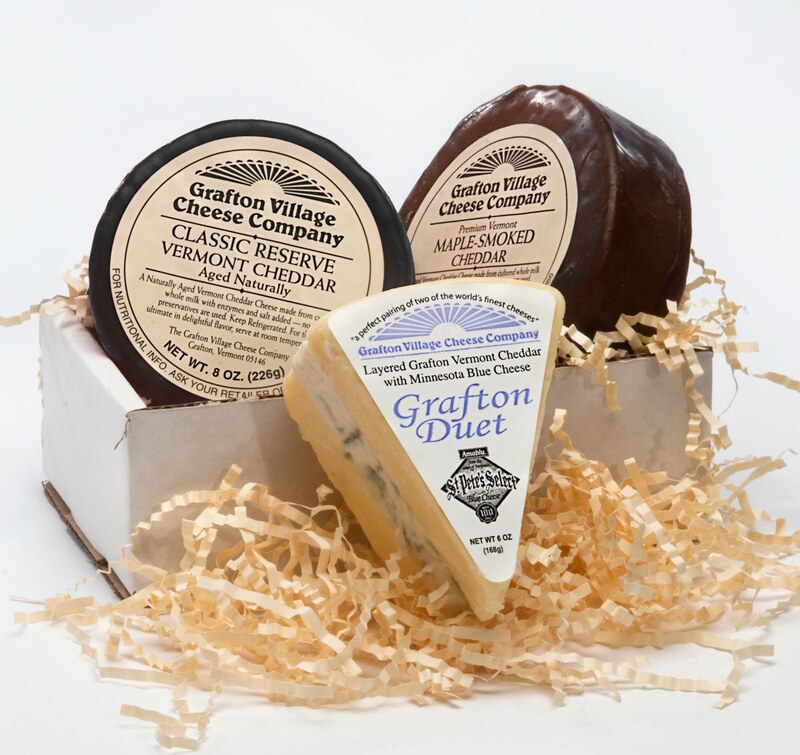 If you can't get to New England, you can still get a taste of it by ordering Grafton's cheddar through their online cheese shop. They sell a lot of cheese in December, in case you were wondering. Leave a comment below telling me your favorite way to use cheddar cheese. Tweet about this giveaway with a link to this post ("Win Vermont cheddar from @GraftonCheese and @erikakerekes [URL]"), then come back and leave a separate comment with a link to your tweet. "Like" my Facebook page at http://www.facebook.com/InErikasKitchen/, leave a message on my Wall or on the Note about this giveaway, then come back and leave a separate comment telling me you've done so. Share a link to this post on Facebook telling your friends about the cheese giveaway, then come back and leave a separate comment telling me you've shared it. Subscribe to this blog (use the "Subscribe" link at the top of the page) by email or in your reader, then leave a separate comment telling me you've subscribed. So you can get up to FIVE ENTRIES in this contest - pretty cool, right? I'll choose the winner at 5pm next Wednesday (September 22)! Make sure you leave a link to your blog, your Twitter name, or some other way for me to contact you in case you win. I'm the first to comment? Either I really like cheddar or I'm just getting to my blog reading early :) My favorite way to use cheddar is hands down, in grilled cheese. A grilled cheese and tomato soup cures all that's wrong. And horseradish cheddar's my fave too, yum! I'll be in Vermont next year, maybe I'll be able to visit Grafton too! My two favorite ways to use cheddar cheese are on 1) mac & cheese.........it just isn't mac & cheese without cheddar.....and on twice baked potatoes. Yikes...that makes me hungry. I just left a note on your Facebook wall. I am hoping to be able to say, "Cheeeeeese, please!" to you! I tweet, I FB and I blog personally and I also do both for a living with major media companies. But this giveaway is just way too much work for my poor tired self, but good luck and thanks for the post. I subscribe to your blog...how could I not? And I love using cheddar cheese when making a simple platter of freshly made bread and apples. The crunch of the apple with the creaminess and sharpness of the cheese is so good! Phew... been meaning to get here all day long!! I have yet to visit a cheese maker so I really enjoyed your post - it is definitely on my list of things to do!! Hmm.. favorite way(s) to use cheddar! Well, a Ploughman's Lunch is probably first on the list, followed by Potatoes Romanoff and of course... quesadillas!!! I am finally getting the hang of "liking" on Facebook!! To Anonymous above who said the contest was too much work - sorry, I must not have made it clear enough - you're already entered just by commenting! All the other things are OPTIONAL if you want to get extra entries into the contest and increase your chances of winning. Glad you stopped by, but you didn't leave contact info, so if you win I'll have no way to get in touch with you! My favorite way to use cheddar is the simplist! I really want to TASTE it, so I LOVE Vermont cheddar slices atop slices of crisp, tart, fresh apple! I tweeted "Win Vermont cheddar from @GraftonCheese and @erikakerekes ! http://ow.ly/2FV22"
I'm from Wisconsin so I'm highly suspicious of Vermont cheese... KIDDING. These days I love to eat it just in slices served with figs and salami. 3. By combining 1 & 2 together! Now to go hit up all the other ways to enter because the mere THOUGHT of horseradish cheese is making me tremble in anticipation. I adore cheese and love cheddar on nearly everything, especially when making homemade Stuffed Mushrooms and Jalapenos, yum! I really like cheddar cheese on crackers but I also use it in macaroni and cheese and in crab dip. Liked you on Facebook as Sharon Rooney and commented on your wall about the contest. What is my favorite way to use cheddar cheese-EAT IT! Just left you a FB comment. Great post, Erika. I love cheese! Being from New England, I think Vermont Cheese is the best. I love sage flavored cheddar, but it's not very easy to find. Yesterday, David made grilled tomatoes with melted cheese. Yummy. He also uses multiple cheeses (a rosemary asiago, extra sharp aged cheddar, havarti, mozzarella, and/or colby/jack) in multiple layers, along with tomatoes (yellow pear from the local farmer's market) and olives for his potato chip nachos. I hope you visited the country store in Woodbury, VT. My friend Carol works there on the weekends. Also tweeted the post to @bigbearfun @cr8vfocus and @doingtheoutdoors and Facebook. Will like your page and put you as a favorite on my Creative Focus | Caroline Quintanilla page. Other than subscribing, I think that covers it. Keeping up with RSS is overwhelming. I use Twitter to find news and blog posts. So glad I found yours! I can't even tell you how I excited I am about this giveaway. About 15 years ago, my husband and I were living in NYC and would take regular weekend trips to Vermont to get out of the city and breathe the fresh air. On our very first trip up there, we stayed at the Old Tavern at Grafton and visited the cheese company. We fell in love with their smoked cheddar. Our favorite way to eat it? With smoked sausage and crackers, sitting beside a Vermont stream, with a Magic Hat beer (Burlington, VT) in hand. I already "like" your Facebook page, plus I left a comment on your wall. I subscribe to your blog on my Google reader. Thanks, Erika! My favorite application for cheddar cheese? Right between two slabs of beef, tucked between two hamburger buns, some onions rings and BBQ sauce. Oh, and did I mention I love cheddar so much that between reading paragraph # 1 and leaving you a comment, I got up from my chair to grab a block of my go-to Tillamook Cheddar out of the fridge for dessert? Oh, and I also nibbled on some aged Gouda from the Winchester Cheese Company (purchased from Irvine Farmers Market). In my famous Mac & Cheese! I'm a "like" on FB. Your in my Google reader! Were linked up in Facebook! Cheese is probably my greatest food weakness and cheddar is at the top of the list! If I had to name one favorite way to use it, it's probably in a ham and cheese sandwich on good rye bread. With coarse brown mustard. Getting hungry just thinking about it! And the winner is...Megan @stetted! Thank you Random.org for helping to pick the winner, and thank you to everyone who entered!